Technology changes the playing field for both commercial and non-commercial business landscapes. In order to stay relevant, each industry has to keep up or risk being left behind. With that, there is a lot of attention aimed at one of the most sought-after tech in recent years: virtual reality. Virtual reality has come a long way. What was originally a topic of philosophical discussion has now become one of the fastest growing technologies of today. Since the 1950s,virtual reality (VR) has been used as a form of entertainment. It has been described to allow the user to feel, see, and hear sensations that may not exist in the current physical reality. VR has been noted to enhance certain experiences, but it was only in recent years that this technology has been used for industries other than entertainment. This technology has now been applied in scientific fields, aiding scientific advancements and education. For example, VR has helped in the education of future doctors, armed officers, and other professions without the risk of human casualties. In addition, Archeologists have also used VR in further understanding how people lived in certain conditions or periods. Because of the cost it took to fund VR in the early to late 2000s, its use was often limited to the said applications. VR entertainment also cost a person a hefty sum back in the day, so it wasn’t often used in every day events. Today, VR has become increasingly affordable. A VR-compatible smartphone and a headset are often the only things needed to experience the technology. This is one of the reasons why many real estate marketing firms have begun to use it for their clients. Companies like TOMS and NASCAR have used VR for advertisement campaigns, with their respective campaigns going viral. Because of the numerous advantages VR has given to the above industries, it’s only a matter of time until architecture and design adopts it as a mainstay in presale marketing. Here, we’ve listed the main reasons why developers and clients alike should consider VR for their future projects. For the potential buyer, convenience and confidence are key. Ensuring that your client’s demands are met is essential to locking in a sale. Clients are looking for reliable agents and value on their projects. How do they know if a presale home will fit their lifestyle if a model unit hasn’t been built yet? How can they trust they will like the layout and design of the biggest purchase of their life? For the client that needs to see it to believe it, VR is the answer. With VR, clients can literally put themselves in the picture. They can ‘walk around’ the area and examine the little details. The size of the room can be put into perspective, and they can also get an idea of what to expect. 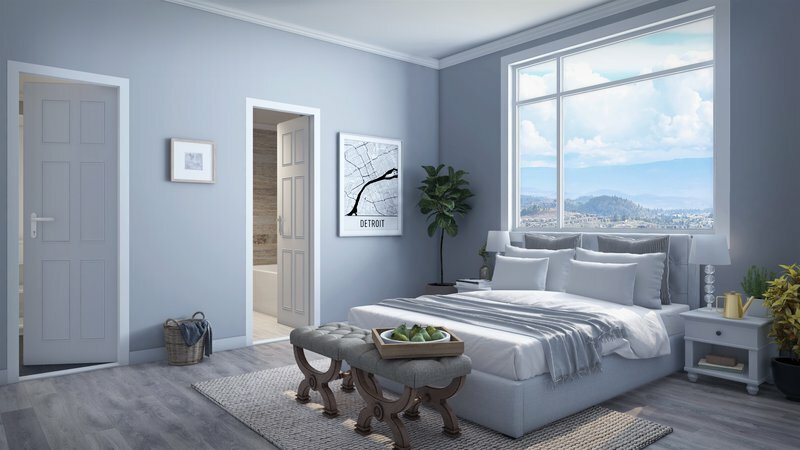 With the introduction of available VR technology such as the Google Cardboard, potential clients can create their own VR set and view the model units in their own free time. This is useful if your client wants to purchase an apartment in, let’s say, Vancouver but they currently live in China. Although VR has been around since the 60s, public interest in it has only grown in the mid-2000s. Commercially, VR has been used mostly for the entertainment industry. Although we mentioned that VR has also been used in education and training, VR is best known to laymen as technology that helps improve your video game experience. Because of the idea that VR is still quite foreign and new, it makes projects with the technology exciting and appealing. This is one of the reasons why architecture, real estate and design firms should consider tapping into VR. Many real estate agencies are yet to adopt Virtual Reality in their marketing campaigns. Being ahead of the competition with high quality work could help make your project go viral, in addition it could bring foot traffic into show rooms as an exciting new technology for people to try out. If architecture and design firms choose to use VR both as a marketing and design tool, it will definitely lift their brand up as a modern and up-to-date competitor; one that is unafraid to take steps to the future. If potential clients want to visualize or understand the scale of a unit by being in the area, they’d have to drive to the nearest showroom. Not only is this inconvenient for the client, it is also an added cost to the developer. You’d have to think of construction costs and the space you’ll have to utilize. In addition, showrooms aren’t just bare and empty rooms. Developers have to dress the room up with furniture, and if a developer wanted to be safe, they’d hire an interior designer as well. What happens when all the units are sold and the showroom is no longer needed? The showroom will most likely be taken down, with the furniture given away (if they’re untrendy at the end of the whole sale period), and another showroom will be constructed for the next project. In hindsight, physical showrooms are a waste of resources. This is why VR will help change that. The only physical materials needed in a VR ‘showroom’ is a VR headset. Most VR headsets cost around only $20, while the slightly outdated Google Cardboard will set you back around $15. Creating VR showrooms are a lot more economical to make. Companies that have extensive experience in 3D rendering, like RealSpace 3D, will find it easy to adapt creating VR environments. Knowing this, companies that already have trusted 3D modeling firms can simply ask them if they offer this service. VR isn’t only helpful to clients. Architects can now design buildings in a smarter way through this technology. Instead of only understanding a certain model through 2D renders, architects can put themselves in the 3D version with VR. This can help them assess how the design looks in a first-person view, something that could only be done after initial construction would be completed. With those features available to architects, rooms or buildings could have certain problems or blind spots fixed right away. This helps avoid money wasted on poor design choices. In addition, safety simulations could be done. In addition, studies regarding the ergonomics of the building or unit design can be taken into consideration with VR, improving the quality of future projects. VR, as a new technology, still has a lot of untapped potential. Although it has made its first forays into a number of industries, it is exciting to see what we can do with this technology in the future—and not just in architecture.